MacBook Pro 13-inch: A welcome return for the FW port, but should have a discrete graphics processor. MacBook Pro 15-inch: A good upgrade, but some may miss the ExpressCard, and it's still expensive. What an update! The new features and benefits that were introduced back in January for the top-of-the-range 17-inch model have filtered down throughout the MacBook Pro range (a line-up that also now includes the newly promoted 13-inch unibody MacBook). Yet prices have gone down, making the new MacBook Pros excellent value for money. The 13-inch and 15-inch MacBook Pros now include Apple's innovative internal battery. By making it nonremovable, freeing up the space previously taken up by connectors and hatches, Apple was able to fit a bigger, stronger battery without adding to the size or weight of the laptop. Expect seven hours' use on a single charge. When it wears out it must be replaced professionally (Apple Stores charge £99 for the two models reviewed here). Yet it lasts for around five years (the equivalent of 1000 charges), which is three times as long as a standard battery, so this isn't a massive drawback. Then there's the screen. Apple's new 13-inch and 15-inch MacBook Pros boast an improved LED-backlit display with a 60% greater colour gamut. When comparing Leopard's Aurora desktop image on the new MacBook Pro with an older Apple laptop, the difference is amazing. The colours look more intense, the gradients much smoother and the viewing angles more comprehensive. The expansion ports have undergone an overhaul too. The ExpressCard slot has been removed from the 15-inch model, and an SD card slot added to all the new MacBook Pros. Some may miss the versatility offered by the ExpressCard, but as Apple's Phil Schiller said at the Worldwide Developer's Conference, less than 1% of users were actually using it and most of those that did had installed an ExpressCard SD card reader. Dropping the FireWire port for the late-2008 13-inch aluminium unibody MacBook proved an extremely unpopular move, so Apple has brought it back for this new 13-inch MacBook Pro. An illuminated keyboard is now standard across the range too; previously it was only available on the higher-end 13-inch models and above. As you'd expect from a largely incremental upgrade, processor speeds have been beefed up. 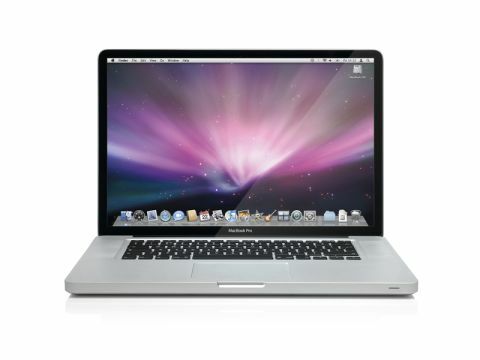 The 13-inch model is available in 2.26GHz and 2.53GHz configurations, with the 15-inch version boasting 2.53GHz, 2.66GHz or 2.8GHz Intel Core 2 Duo processors. The extra speed really showed in our benchmarking tests, though interestingly, all three new Apple laptops we reviewed this issue performed identically in our iTunes encoding test. It seems that the optical drive is the limiting factor, and not the processor speed. The new MacBook Pros performed very well in our Doom 3 test too, tackling the game's highest graphics settings with ease. At slightly south of 40 frames per second it was eminently playable on the 2.53GHz 13-inch model, but on the 15-inch MacBook Pro, it really came into its own. The higher-end laptop's discrete graphics chip lifted the frame rate from just under 42fps to a blisteringly fast 86.4fps. The 13-inch version lacks a discrete graphics processor. As it's now part of the Pro range, perhaps it shouldn't. With all these extra features, you'd be forgiven for expecting a price rise. Instead, there's been an across-theboard price drop, with the new models costing up to £100 less than their last-generation equivalents. At entry level, 13-inch MacBook Pro costs £899, down from £929. The cheapest 15-inch model costs £1,299, down from £1,369. It has to be said the two models tested here are still a little expensive, but you're getting a lot of Mac for your money and the bang-per-buck ratio is moving in the right direction. There really isn't much to criticise here. For some reason, out of the box the new MacBook Pros are downgraded to the slower, 1.5Gb per second SATA protocol, which is bizarre considering the MacBook moved in the opposite direction. But a firmware upgrade which restored the Pros to the faster, 3.0Gb/sec SATA II speeds was soon released, and unless you plan to replace your hard disc drive with a speedy solid-state drive, you'd never notice the difference. Combining the unique style and strength of Apple's sleek aluminium unibody casing together with a gorgeous new screen (and some exciting component upgrades), the new MacBook Pros are a real winner. And at the reasonable prices of £1,149 and £1,699 respectively they truly represent a substantial investment, especially in these current recession-hit times. Suffice to say, a solid performance increase coupled with a significant price drop can only be welcomed.